Black ice coats the roadways like a transparent sheet, making them very slick. Since the ice is clear, the black surface of the road shows through, thus the name “black ice.” If it’s raining when temperatures hover below freezing, ice will form on the roads, resulting in these dangerous conditions. Statistics show that black ice caused 477 deaths during the 2008 and 2009 winter season and 458 deaths during the 2009 and 2010 season. 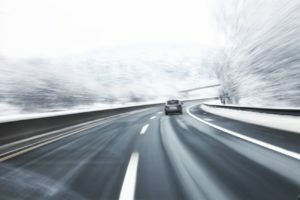 While driving on these slick roads is dangerous anytime, combining drinking with black ice spells disaster and possible death for the motorist, passengers and anyone else unlucky enough to be caught in the aftermath. Driving on black ice requires extra alertness, improved reflexes and reaction times and increased focus on the road. However, alcohol reduces nearly all these responses just when they’re needed the most. When you combine the slackening in reaction time with possibly impaired vision caused by alcohol — and the difficulty in even spotting black ice in the first place — a DUI driver has a minimal chance of seeing and responding to this perilous hazard. Worst of all, most Colorado drivers at least know to be on the lookout for ice and slick surfaces during the winter, but frosty conditions during the autumn months often catch drivers and pedestrians alike off guard. Do not drink and drive. While you shouldn’t drink and drive under the best of conditions, you need to be at your peak driving performance levels to manage ice. Be especially alert for ice in the mornings and evenings and after rainstorms. If it snows or sleets, you (and everyone else on the road) will know that ice hazards might exist, and you’ll adjust accordingly. But you (and others) might shrug off a November shower as a trivial event… not realizing that small amountss of runoff from that shower might freeze on the roads. Be aware of predictable places where black ice might form. Shady areas, back roads, overpasses and bridges hold an extra risk for black ice formation, so exercise special caution in these areas. Take your time turning and braking. During and after inclement weather, maintain a longer distance between your car and other vehicles on the road. That way, you will have more room to stop. Do not pump or lock your brakes if you have a newer car. Your vehicle will compensate for black ice by using a pulsating vibration in the braking system. Locked brakes sometimes worsen skidding and make controlling a vehicle even more challenging. Statistics released from Mothers Against Drunk Driving show that more than four times as many fatal crashes involving a drunk driver happen at night as opposed to during the day — 36 percent vs. 8 percent. Since black ice is especially difficult to see at night, use extra caution and exercise defensive driving tactics when driving at night.